According to the announcement by the U.S. Health Agency, the National Institute of Health is hoping to get government funding in order to conduct a study inserting human cells in animal embryos. Although critics are warning of the ethical consequences, the study will try to create a mix of human being and an animal. According to the activists fighting against the idea of human-animal hybrids, this will completely destroy the species on Earth. According to the announcement by the U.S. Health Agency, the National Institute of Health is hoping to get government funding in order to conduct a study inserting human cells in animal embryos. Although critics are warning of the ethical consequences, the study will try to create a mix of human being and an animal. According to the activists fighting against the idea of human-animal hybrids, this will completely destroy the species on Earth. NIH states that the controversial study will have major breakthroughs in fighting many diseases, like Parkinson`s and Alzheimer`s, and it can be used in growing organs for human transplants, which will definitely solve the problem of constant shortage of body parts. They issued “Guidelines for Human Stem cells research” in 2009, which is banning the use of human cells in animals and breeding animals created with human sperm cells or eggs. 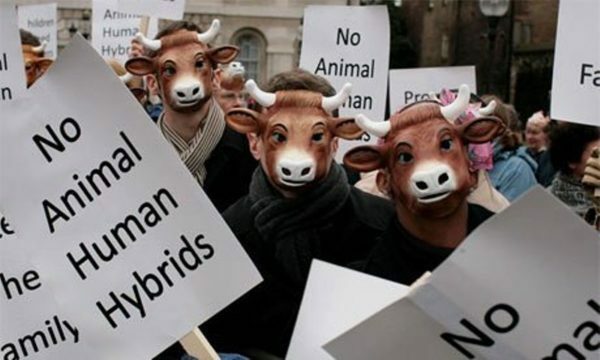 The Guideline was praised by the activists fighting against human-animal hybrids. Then again, in 2015, NIH prohibited the researches on using human cells with animal brains. After a while they changed their mind, and now they want to conduct studies in the field they have banned. Critics warn that this proposed study will raise many ethical issues, because this subject is still controversial and unacceptable by the modern society. Altering the animal brain with human cells is very unethical, since animals don`t have the right to make a decision on this matter. The NIH is not listening to what critics have to say. Their Associate Director for Science Policy, Carrie Wolinetz has issued a statement on their official web page, stating that the decision of the agency, on the thing they have previously banned, can help the agency`s researchers. She says: “I am sure the proposed changes will give the opportunity to NIH researchers to responsibly move forward this scientific area.” She claims that human cells in animals is not something new, it has already been used many times in the biochemical industry. But what NIH wants to do is very different from what the biochemical industry is doing. Their proposal includes early stage injection of human stem cells in animal embryo, which will theoretically contribute to the development of this animal, growing in half animal half human. This is the main reason why critics are opposing the study so strongly.